Anguilla is a 16-mile-long coral formation created by a geologic uplift which created numerous bays, salt ponds and the beautiful beaches we see today. The earliest inhabitants were Amerindians. Their tools, discovered on the northeast part of the island, date to 1300 BC. By the sixth century, large villages were occupied in what are now Rendezvous Bay and Sandy Ground. The Anguilla Archeological & Historical Society has unearthed thousands of artifacts, some of which can be seen at the Heritage Collection in East End. Call for an appointment: (264) 497-4440. The first Europeans arrived around 1564 and were part of a French expedition. At this time the island was given its name meaning "eel" because of its elongated form. The British settled here in 1650. The dry climate did not lend itself to farming and eventually the inhabitants turned to the sea, becoming shipbuilders, sailors and fishermen. Today watersports are one of the main attractions of the island. Diving, snorkeling and sailboat racing are enjoyed by islanders and visitors alike. The local government, concerned with retaining the island's natural resources and inherent beauty, has kept growth to a slow pace and therefore not allowed casinos (although there is still development like - Anguilla's first 18 hole golf course). 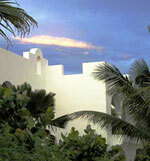 You will find the surroundings peaceful, the service superb and the people friendly. The island is known as a retreat for celebrities, and is sometimes called the "South Beach" of the Caribbean - a major draw being the myriad of fine dining spots - you won't leave Anguilla hungry.